I love roses and would really love to try rose jam! Never even thought of it as a recipe so thanks for sharing it! I know, it’s a strange one isn’t it? But the perfume is lovely and it’s amazing that you can bottle the essence of roses so easily at home. It will be interesting to open a jar in the middle of December. I’m going to try using it in chocolate truffles too – rose and dark chocolate is a very exotic combination. 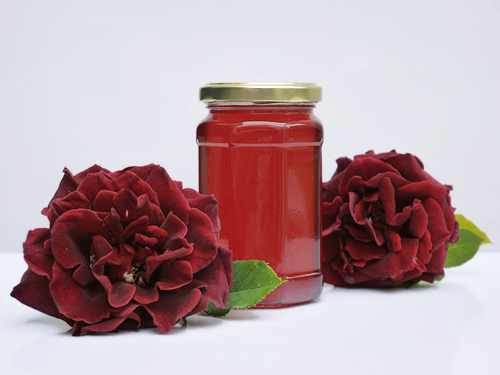 I think my mum said that rose petal jam was one her dad had made when she was a kid – he used to make a lot of chutneys, jams and jellies. I’ve been idly thinking about doing so too but never have. Love that you did, it looks so beautiful! Thanks Kavey – it’s a real breeze to make, I recommend it. I’m also a bit of a chutney fiend, probably guilty of throwing too much random stuff in a pot and hoping for the best. I love lots of spice, so reason that everyone else does too! Looks amazing. It must smell heavenly too! There is a traditional Indian rose preserve called Gulkand, used to flavor desserts and stuff. Hi Anjana – it does smell lovely. Not long after I made this, we had very hot weather and all the roses bloomed and vanished. I felt quite happy that I had managed to capture their perfume when I had the chance.